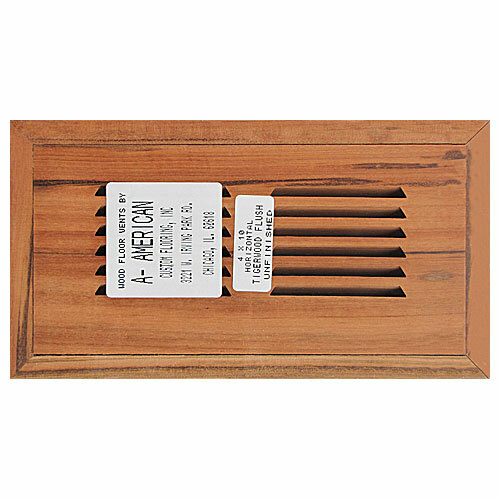 You are here: Home » Your Account » Flooring Supplies » Wood Vents » Tigerwood » Tigerwood Wood Vent Flush Mount With Damper 4"x10"
Tigerwood Wood Vent Flush Mount 4"x10" No DamperTigerwood Wood Vent Flush Mount With Damper 4"x12"
Tigerwood Wood Vent Flush Mount With Damper 4"x10"
Tigerwood Wood Vent Flush Mount With Damper 4"x10" is a quality hi-output flush vent. overall area (sq. in. ): 4"x10"
Santos Mahogany High Output Wood Vent Flush Mount With Damper 4"x12"
Red Oak Wood Vent Drop In With Damper 6"x14"